Don't let zombies eat your brain. 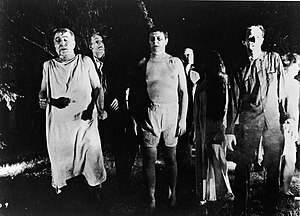 As a web analytics guy, I’m acutely aware of what zombies go after first: Brains. I’m so aware of this that I co-founded ZombieScore with my friend Jeff Turner–so I could improve my general safety and well-being in the event of the Zombiepocalypse. But I’m not here today to to talk about ZombieScore’s proprietary ZombieRank algorithm. No, I’m here to talk to you about keeping zombies from eating your brain. Zombies, while they look slow and dimwitted, have a pretty straightforward strategy for messing up your business. They remove your capability for making good decisions by eating your brain. Here are three ways Zombies are likely to eat your web analytics. Don’t let it happen to you. This zombie tactic is perfect because it’s usually a year or two into a site launch before business owners really take the time to get serious about making their site better. And if business owner hasn’t been tracking any data all that time then there’s no historical data to compare. It’s like not collecting interest on a valuable asset for a year or more and instead handing it over to… the zombies. WordPress sure is nice isn’t it? You can choose a new site design every couple minutes with the press of a button. Zombies love that about WordPress. They love it because sometimes the web analytics code is hardwired into your theme or is installed via a theme-specific control panel. When you change themes, your web analytics code can sometimes be dropped. I’ve seen this and it’s ugly. A vibrant, healthy website beating along and then nothing. Flatliner. This technique is especially insidious because the site owner may not realize it’s happening and the effects won’t be fully felt for at least a year after it’s been discovered. For businesses that have seasonal traffic flows you might want to compare this month with “same time last year.” If the zombies accidentally uninstalled your web analytics during your website makeover then you might not have “same time last year.” The zombies, they have all the time in the world. If the zombies can’t put the hurt on your website with the previous two techniques they’ll almost certainly put this one into effect. If they can keep you from getting the most useful information out of your web analytics efforts they know that your use of data for making your business better will slowly wither and die. Goals: if the zombies can keep you from configuring goals you’ll never get the clearest picture of which traffic sources and content help your business the most. Meaningful dashboards: if the zombies can keep you looking at scary but meaningless numbers (like site-wide bounce rate) they know you’ll cower in fear of your analytics reports. Marketing campaign tagged URLs: Zombies usually have an easy time of keeping business owners from using “complicated” codes for tracking the effectiveness of marketing campaigns. This technique is one of the easiest for zombies to pull off because configuring an analytics installation well requires business owners to really spend time thinking about the website should do to help business. That’s not as much fun as picking the colors and pictures. Zombies love it when we’re distracted by shiny objects and colors and pretty pictures. Read about web analytics here and anywhere else you can–and try some of the techniques. Hang out with professional zombie killers web analysts at a Web Analytics Wednesday. Stay vigilant. Be prepared. Keep your brains.